Wheelchair Lifts – Vertical Transport Inc. Physical handicaps can make entering and leaving a home or office very challenging, and sometimes impossible. Vertical Transport takes pride in providing a creative solution to mobility issues by installing just the right vertical platform lift to meet your needs. When visual presentation is of utmost importance, a platform lift is an excellent alternative to large, unsightly ramp systems. Vertical wheelchair lifts provide access to porches, entryways, and mezzanines. 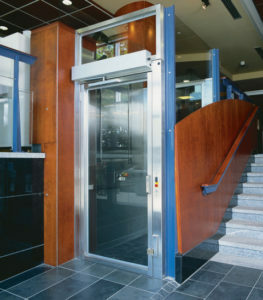 Wonderful space-efficient alternative to ramps, these lifts are easily installed and very user friendly. Contact us today to discuss your needs. We look forward to working with you on your customized solution.